Did you hear the big news?! I’m so thrilled to finally share that Dream Green DIY was recently mentioned in the brand new April issue of Food Network Magazine! The editorial team for the brand reached out late last year to ask if I wanted to be part of their Easter issue, and, of course, I couldn’t say “Yes, please!” fast enough. Several months later, the issue has finally hit news stands and I’m here to share a full breakdown of the project that I contributed: a DIY Painted Blue Ridge Mountains Easter Egg. The theme for the particular story I’m involved in is a roundup of 50 hand-decorated eggs from bloggers hailing from each of the 50 states. We were tasked with creating a unique design for our eggs that represented our own individual states. It was super easy for me to come up with the design for my own mountain-themed egg since we live a stone’s throw from the Blue Ridge Mountains here in Virginia. Even our 5-minute drive to the grocery store is accented by stunning views of rolling blue mountains in the distance, and I’ve always been emphatic about appreciating that perk of our home here in Virginia. 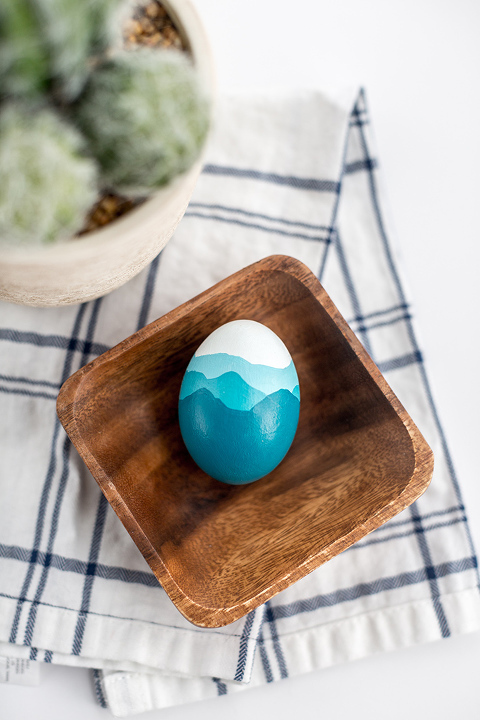 I actually finished up the painted egg for Food Network right before Christmas last year, and now that it’s officially in print for all the world to see, it’s time to share the DIY tutorial right here in case you’d like to pay homage to your favorite mountain views this Easter. If you watch the .GIF animation a few photos down below, you’ll see that the process couldn’t be easier to recreate my mountainous look. 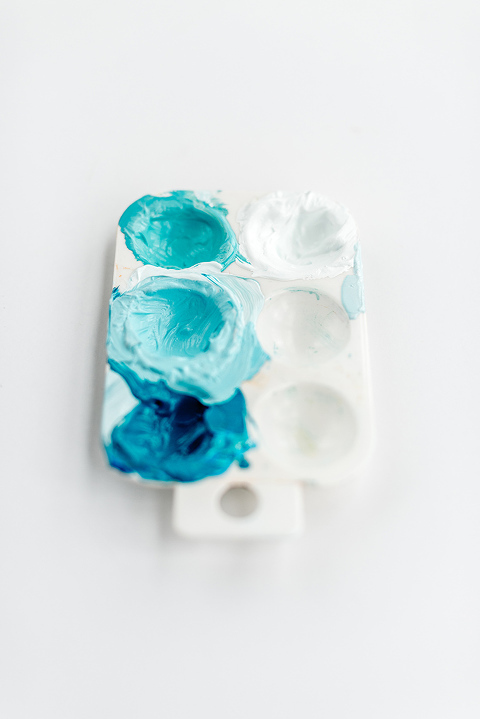 First, mix three different colors in your paint tray: one is your chosen paint color with no added white, the second color is your chosen paint color with a little white paint mixed into it, and the third color is your chosen paint color with a little more white mixed into it. 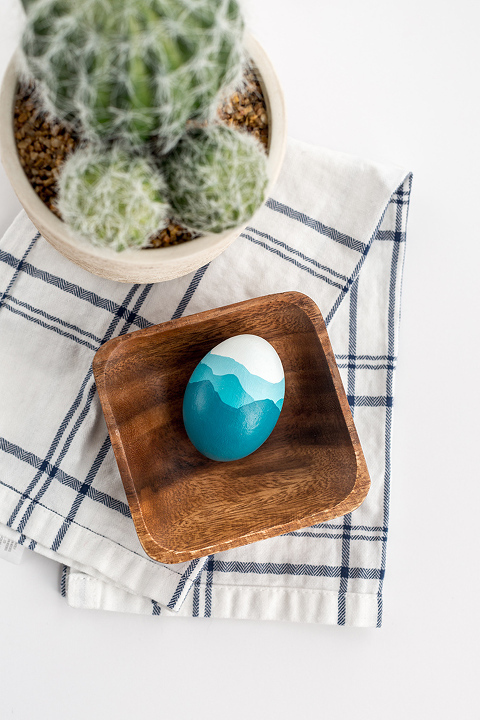 Paint 2/3 of your egg with the lightest mixed paint color, giving the top a wiggly edge to mimic the look of mountains. 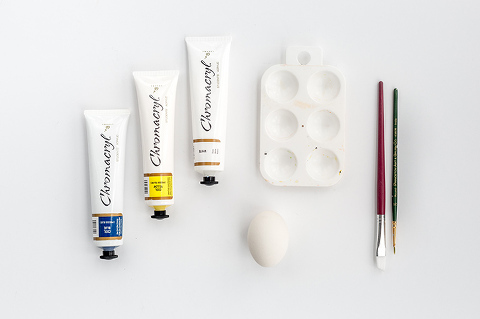 Then, paint 1/2 of your egg with the medium tone color you mixed, again giving the top edge an uneven look. Finally, paint the lower 1/3 of the egg the darkest, most pure paint color you chose. Note that the uneven mountaintops look best when they are a little different from one another. Asymmetrical, in this case, is really good. You may even choose, like I did, to bring a couple of the higher mountain “peaks” up and over the layers to make them feel more three-dimensional. In other words, make the darkest color push over the middle toned layer to touch the lightest color toward the top. You can see what I mean in the picture below if you focus on the right side of the egg. Big thanks to the team at Food Network for including Dream Green DIY and my design in their lineup of 50 DIY Easter eggs, and please let me know in the comments below what type of design you would create to honor your home state. *I earn a small percentage from purchases made by the affiliate links above. Affiliate links are not sponsored. You can rest assured that I would NEVER recommend a product that we don’t use and love ourselves!